ScanExpress JET™ represents a quantum leap in automatic circuit board testing. The JTAG Embedded Test (JET) method extends boundary-scan structural test coverage to virtually every signal that is accessible by the on-board CPU(s). Click here to view the ScanExpress JET Whitepaper which provides an overview of what JET is, how it works, and the benefits of using JET in conjunction with existing boundary-scan and ICT test methods. 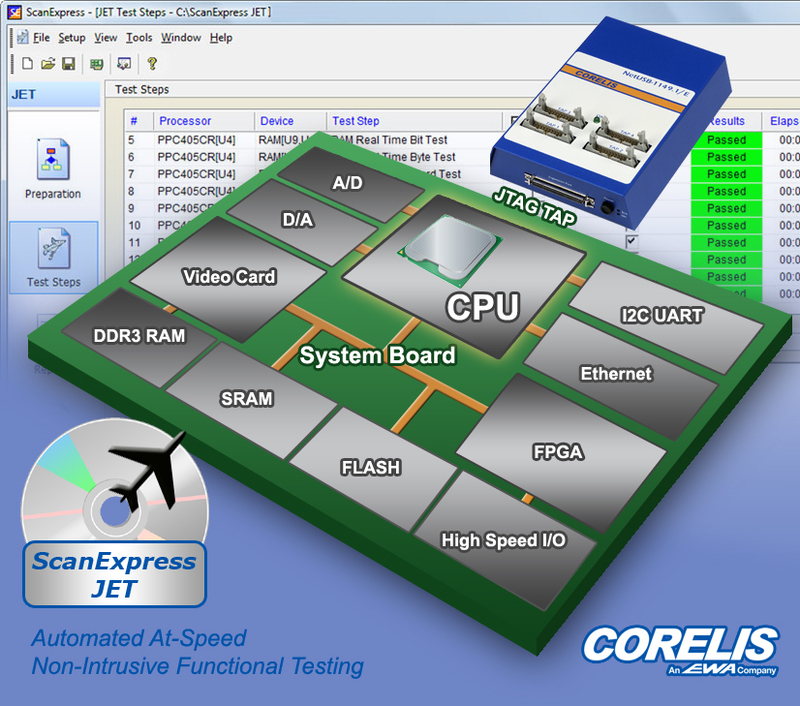 ScanExpress JET utilizes proprietary JTAG Embedded Test technology, which uses a processor’s JTAG debug port to download and control native processor code where at-speed functional testing of the Unit Under Test (UUT) is performed. In addition to providing test coverage for non-JTAG components, this technology also allows programming of flash memories at their fastest theoretical programming speed. Dramatically extends structural test coverage by augmenting functional tests when the UUT includes a CPU with a JTAG debug/emulation port. Multiple CPUs of the same or various types are also supported. High-speed in-system processor assisted Flash programming saves time in development and production phases. Automatically generates functional diagnostics tests saving months of coding time and associated overhead costs. To further reduce mistakes, an intuitive GUI guides the user through a logical sequence of steps for constructing test steps from start to finish. Fully integrated “C”-style script language with a single-step capability assists in writing custom tests to further increase the test coverage and diagnostics. 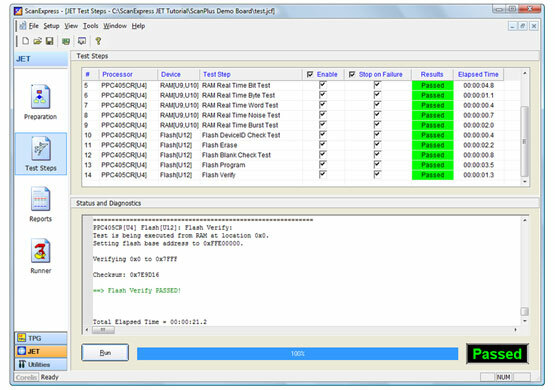 Pre-compiled user embedded test code is also accepted so that users can re-use existing diagnostics code. Components are tested functionally at-speed using test routines downloaded via JTAG into CPU cache memory or RAM. Increases test reliability and helps diagnose failures when the board does not boot. Same test station and GUI for structural testing, functional testing, and in-system programming. Using a single JTAG controller for boundary-scan, functional testing, and programming greatly reduces costs and test fixture complexity. It is possible to overcome poor Design-For-Test (DFT) practices in a circuit board by coupling boundary-scan test with JTAG Embedded Test in a unified test methodology. All CPU accessible resources such as memories, CPLDs, FPGA, UARTs, and other peripherals. Reduces or eliminates the use of In-Circuit Testers (ICTs) and Flying probes saving time and cost associated with test fixtures. Automatically constructs test plans that can be executed directly via ScanExpress Runner™ simplifying test plans generation and reducing mistakes. Great tool for testing, diagnosing, and troubleshooting ‘bone pile’ of functionally inoperable UUTs that pass boundary-scan tests but fail functionally. Wide range of supported processors and peripherals. Helps detect hard to find power and ground structural defects by means of running at-speed tests continuously and rigorously. Special memory tests exercise UUT functionally to make sure that Power and ground pins are properly connected and do not cause intermittent failures. Typically, power and ground pins constitute 10-20% of high-density device pin count and there is no easy way to test that these pins are all connected. Furthermore, there is no way to detect open ground or power pins as often a device will work correctly even if several of its power and ground pins are not connected. Often, such a device, with some open ground and/or power pins, may pass boundary-scan tests and even power-up tests and this manufacturing defect may go unnoticed until intermittent behavior is observed in the field. Table 1 depicts how combining the features of boundary-scan test with JTAG Embedded Test increases the test coverage and reduces test development. Who can benefit from using ScanExpress JET? Test engineers that want to increase their boards’ test coverage and extend their boundary-scan tests with at-speed functional tests. Design engineers that need to debug their prototype at-speed before test firmware and/or test fixtures are available. Firmware/software engineers that want to save time and resources by creating diagnostics tests automatically. Field application engineers that want to verify if indeed a customer’s board is bad. Repair engineers who want to find board failures quickly and at the lowest cost to the customer. 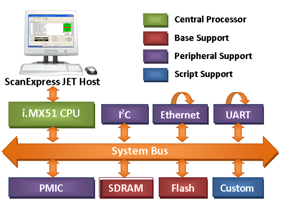 JET utilizes a processor’s JTAG debug port to download and control native processor code where at-speed functional testing of a Unit Under Test (UUT) is performed. In addition to providing test coverage for non-JTAG components, this technology also allows programming of flash memories at their fastest theoretical programming speed. Corelis pioneered JTAG emulation and has provided customers with thousands of JTAG emulators for many CPU types. 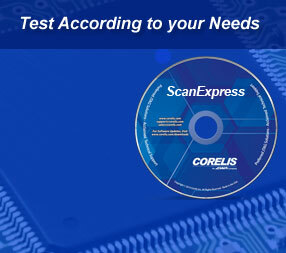 Corelis is also the world leader in boundary-scan test tools. Combining these two technologies into one product provides customers with an integrated development and execution test environment with a single point of contact and support. 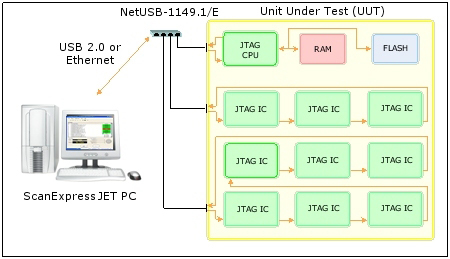 The JET testing method depends on the UUT having a JTAG-enabled processor (CPU) on-board. The CPU dedicated JTAG Test Access Port (TAP) is generally routed to a single emulation connector on the board. Other JTAG interconnect scan chains may be connected to different JTAG connectors which are used for boundary-scan testing. The CPU debug TAP brings control and visibility of the processor itself to the host. This is the same TAP employed by JTAG emulators for software development and debug. Included are access to the CPU register/control structures, attached memory, and the ability to utilize the CPU debug running/stepping facilities for testing. The host software uses these features to download test/diagnostics routines into the CPU’s cache memory and into the target memory. These routines execute at speed and pass the test results to the host. There is no need to modify the on-board application software, typically stored in Flash memory. The Flash memory itself can be similarly programmed using the CPU as an algorithm expediter. This avoids the slower wiggling approach of JTAG Flash programming. A board may include a single JTAG TAP that is dedicated to a specific CPU. This TAP is used for software debug and/or boundary-scan test. A board may also include multiple JTAG TAPs, one of them being used for software debug and/or boundary-scan test and the other TAPs being used for boundary-scan test. Corelis’ JTAG controllers support multiple TAP configurations with a single controller. There is no need to switch cables or use relays when moving from a debug to test environment or switching from boundary-scan test to JTAG Embedded Test. Figure 1 depicts connecting Corelis’ NetUSB-1149.1/E™ JTAG controller to a board that includes a CPU with a dedicated JTAG port, and additional boundary-scan compatible devices chained into separate JTAG ports. The ScanExpress JET tool is available as a stand-alone application or as a plug-in to ScanExpress TPG. Functional tests that are generated using ScanExpress JET are also compatible with the ScanExpress Runner test executive. 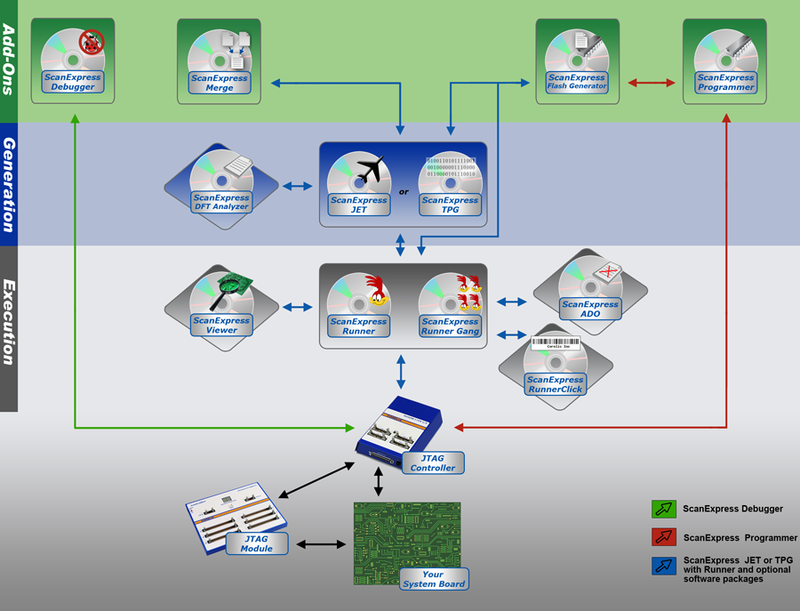 Figure 2 depicts the ScanExpress JET GUI. Preparation — Several screens that guide the user step by step on how to collect information about the devices and setup of various test options. Following these steps, the tool automatically produces the functional test steps. Test Steps — Program that executes the test steps that were previously created by the preparation function. Reports — Analysis program to view and calculate test coverage statistics. Execution with the ScanExpress Runner option — Invokes the ScanExpress Runner test executive to run both boundary-scan and JET tests from a single test plan. ScanExpress JET has the ability to record all feature selections and file references to enable recalling a given project. This serves as a mechanism to quickly retest previous target boards as well as providing a starting point for migrating similar test scenarios. When operating as a plug-in to ScanExpress TPG™, ScanExpress JET inherits the boundary-scan environment parameters, including all settings and files of the host application. This constitutes a set of sequential screens which guide a user in selecting options and declaring device specific parameters. It collects all the information required to perform automatic testing using the JET methodology. It also includes optional JTAG operations to assure minimal board connectivity at the outset. Devices — The tool requires knowledge of CPU visible resources in the circuit. This includes information such as memory device features including size, width of the addresses, etc. Much of this information can be obtained automatically by the tool. Custom test scripts — User developed test routines beyond those automatically created by the tool. The information collected becomes part of the project when saved. Completion of the Preparation phase results in the automatic creation of scripts, download routines, and embedded test steps required to perform specific board testing. The Test Steps screen lists the test steps automatically created during the preparation phase and provides controls to run tests on the target and view results. The steps can be invoked individually, run in their entirety or with an enabled subset, and can even be looped. Progress while the steps are underway is also indicated. This screen shows a PASS/FAIL indication summarizing the overall outcome of all enabled test operations. Detailed diagnostics of failure causes is displayed. The Reports function provides access to test coverage statistics enabling the user to determine the overall testability utilizing ScanExpress JET. Included are merged coverage statistics showing how well testing confirms board operability. Coverage information includes both JET steps as well as legacy boundary-scan tests. ScanExpress JET test steps can be executed from the ScanExpress Runner environment. 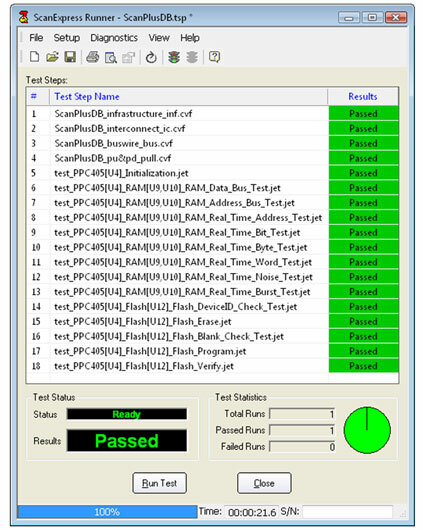 ScanExpress JET will automatically pass the generated test files to ScanExpress Runner. Clicking on the Runner icon in the shortcut pane on the left side of the ScanExpress JET main window launches ScanExpress Runner. Using ScanExpress Runner to execute boundary-scan tests in conjunction with JET based tests provides a single test environment for a complete test using both test methods. Verifying structural integrity with JTAG interconnection test prior to running JET functional tests results in better overall diagnostics during failure conditions. Figure 3 shows a test procedure within ScanExpress Runner that contains both boundary-scan and JET functional tests. This diagram represents how ScanExpress software works together in providing a solution optimally geared according to your needs. Click on the diagram to visit individual software/hardware pages, or use the links below. The JTAG Embedded Test (JET) method extends coverage beyond popular boundary-scan techniques to virtually every signal of the UUT that is accessible by on-board CPU(s). This includes most of the remaining non-scannable, analog and I/O port resources. Click Here for a list of some important JET Benefits. Corelis offers an extensive line of boundary-scan software packages that can also be custom tailored to create the right package for any user. For complete information on ScanExpress JET, please refer to the detailed datasheet for this product.